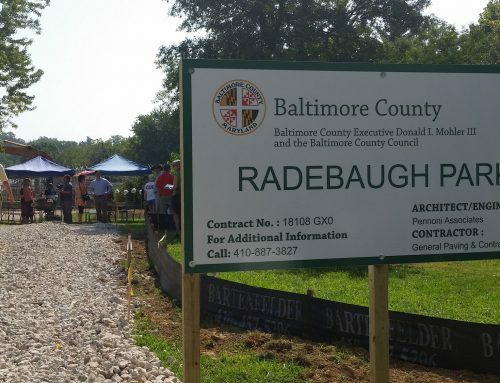 For 20 months, Baltimore County has been trying to acquire a portion of the Radebaugh property off Aigburth Avenue for parkland. The subject property currently includes some older greenhouses but does not include the greenhouses or flower shop on Burke Avenue or the design center on Aigburth Avenue where the Radebaugh family plans to continue to operate for many years to come. We are pleased to let you know that the Radebaugh family has signed a contract of sale. An environmental study still needs to be done to determine if there is contamination; once that is back, and hopefully any issues resolved, the contract will be sent to the County Council for approval. The Maryland General Assembly provided funding to help with demolition and improvements to the property. This project has occurred because of support at the state and county levels, and because of persistent community support. Thank you for your help.